This instructional video on spinnerbaits will help ALL ANGLERS become smarter fishers. Subscribe! This article has been made into videos on YouTube! Check 'em out. Every fisherperson SHOULD KNOW the basics of what is in this video. Can fishes see color? What is the lateral line? Do fishes have ears? - Can you answer these questions? Want to know more about a MUST-HAVE lure type? A type that is effective in practically EVERY WATER for MULTISPECIES FISHING? Then let’s talk about spinnerbaits: the basic types, how they work, why they are so effective, and how to play them to catch your target fish. Also I will describe 3 proven methods to play your spinnerbaits for more hits! I’ll explain how a jingly chunk of metal that looks nothing like natural prey works to catch fish! So even if you haven’t ever fished, this is an interesting ‘how it works’ of spinnerbaits! If you aren’t using spinnerbaits then you might want to reconsider. If you do use spinners, then stick around and I bet there is a thing or two you could learn to further master your fishing skills. This article will have a basic overview as well as some in-depth scientific reasoning as to why fishes SLAM spinnerbaits. With a bit of knowledge you will fish smarter and more efficiently for greater catches! Any lure with a spinning blade can be considered a spinnerbait. The safety pin, or overhead arm spinnerbait for fishing inland waters will be covered more thoroughly, which is one my favorite lures for catching bass, pike, musky, panfish, walleye and lots of other predatory species. Let’s get to it! The red arrows point to the blades of these three spinnerbaits. What Makes a Spinnerbait a Spinnerbait? -Blades. They key feature of any spinnerbait are the blades, or disc-shaped objects usually made of metal that rotate around a fixed point on the wire frame, or arm. When trolled and retrieved through water these blades will spin around the lure causing pressure waves (or thump) as well as visual stimuli that will entice fish to strike the lure. (More on fish sensory responses below.) The blades are concave, or indented, to continuously push and pull water, allowing consistent displacement of water that produces the pressure waves. The blades rotation also creates a consistent source of altering light reflections, otherwise known as flash. Blade texture and size plays the most important role in flash rather than type (i.e. Colorado, willow, etc.) A honeycomb-textured blade will reflect more light than a smooth blade as it has more surface area, as well as more opportunities for directed light to reflect in various directions, and is very effective when the light source is adequate and unimpeded such as on a bright day in clear water. There are many variations of spinnerbaits with two prominently used variants: the in-line and the safety pin. The in-line spinner design is fairly simple. Usually one or two blades are rotating around a central axis where the blades are separated by beads to enable frictionless motion. A weighted head and/or body lies in front of the treble or single hook. Often a covering (hair, skirt, etc.) is set just above the hooks to hide the metal hooks. As discussed earlier, the blades are what make the spinnerbait a productive lure. They create flash for visual stimulation as well as pressure waves for physical stimulation (sometimes known as ‘thump’.) These are concave/convex and come in numerous shapes, sizes, colors, & materials. Most blades are nickel or gold plated from brass stock, but there are a number of other options, such as silver plated, copper plated, orange coated and luminescent. 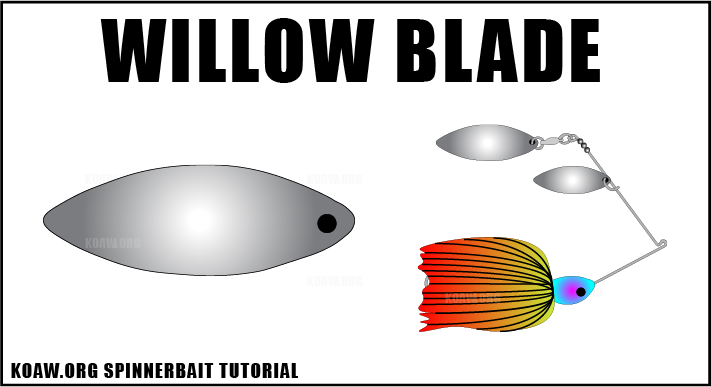 Colorado Blade – This is one of the two most common shapes for spinnerbait blades (the other is the willow blade discussed below.) This blade is wider and often deeper than the willow blade and will generate more vibrations in the water (those pressure waves.) These blades are used for slow retrievals at deeper depths in darker conditions. Deep cup Colorado blades offer even more vibration for lowlight conditions. Colorado blades are great for open water scenarios. Basically, the Colorado blade is fat and slow. Willowleaf (Willow) Blade – This is the other most common shape of blade. The narrow, streamlined blade must be played faster than Colorado blades to maintain the blades’ rotation. These are ideal for quick retrievals through macrophytes (aquatic plants) and for high water column or topwater action (bulge, buzz, and water-skiing.) Willow blades are often used in well-lit, clearer waters. Basically, the willow blade is thin and fast. Indiana Blade – This third most common type is shaped like a raindrop. Its performance of vibration and rotational speed lie between that of the Colorado and willow blades making it a more versatile lure. It maintains the narrow shape of the willow and the roundness of the Colorado. In-line spinners often have Indiana blades. Basically, the Indiana blade is a versatile hybrid. Basically, the Oklahoma is a not-as-often used hybrid that may provide an advantage in heavily fished waters. There are many more shape-and-design types of blades such as serrated, rippled, chopper, fluted, royal, whiptail, and thumper. Each offers unique aspects of the sound and visual profile. Many anglers make their own spinnerbaits or change accessories on premanufactured purchases. The wire arm is usually made of variants of stainless steel. Different metal compositions offer different tensile strengths and vibrational allowances. The two main eye types are R and twisted with R being more popular for safety pin spinnerbaits. COMMON MISTAKE: Do not attach a swivel directly to the R eye of a spinnerbait. Twisted eyes may directly receive a swivel attachment whereas the R eyes should receive the line or wire tied at the eye. In-line spinnerbaits will more often have treble hooks while safety pin spinner baits are usually wearing single hooks. Each type may add stingers, or extra hooks, to increase hook-setting efficiency. This is an extra dangling hook connected to the main hook, either rigged pointing up or down, and increases hooking effectiveness as well as reducing the chances of the fish spitting the lure during a jump or shake. Cut tubing of silicone, latex, or rubber is used to fix or limit the movement of the stinger on the main hook. The split rings are what connect the blade to the swivel that is attached to the wire frame. Ball bearing, crane, and roller swivels are used to diminish friction and ensure proper rotation of the blades. A bead or two (or more) are inserted to help diminish friction and create spacing. They offer a surface for the clevis and blades to bump against, acting as a barrier for spacing needs. The head and/or body are most often made from lead molds. This component is not only important for visual appeal where an eyespot painted on aids in the appearance of a fish eye, but also as a counterbalancing weight for the arm not housing the blades. The skirt is tied to the body or attached by a silicone or latex collar and covers the majority of the hook. The skirt enhances the profile of the lure. There are a myriad of options for skirts with various materials, sizes, and colorations. Skirts are usually made of round rubber, silicone, and hair. Silicone seems to be the most popular on the market for the more diverse profile options available: metallic flakes, luminescence, and fixed-shapes. Silicone skirts also maintain a larger profile and wiggle more effectively during retrieval whereas hair skirts condense quickly offering lesser flair. Keep in mind that the skirt will add weight and resistance to your spinnerbait. When altering skirts, mind the changes to the action of the lure. Spinnerbaits should always run true—meaning that the blades and body should be oriented vertical upon retrieval, one directly over the other. The body, often made of lead, should be seated beneath the blades. Often fisherpersons will dip their skirts in dyes to change the color scheme of the profile. Also, liquid and paste scents may also be applied to the skirts and blades. Some fishers say that applying paste to the blades is a better strategy as the blades disperse the scent far better (I too would agree.) Either way, adding scents to your spinnerbaits will trigger the chemosensory organs in fishes—so keep in mind, this may limit your versatile, multispecies spinnerbait by dissuading certain predatory fishes that find the scent unappealing. However, applying scents is more likely to produce second hits should the first hook-set fail. 3. Why Would a Fish Want A Spinnerbait? Seriously, why would a fish want a chunk of lead, jingling metal, and non-natural looking silicone that looks nothing like any natural prey item? I used to ask myself this too until I learned about fishes and their mechanoreception (lateral line and hearing) and visual reception capabilities. Also, the rotating blades are vibrating the rest of the spinnerbait; the wire arms, the body, and the attached skirt are all in fast motion, therefore those individual silicone strands do not appear as a bunch of single elongated pieces but as of a semi-transparent whole body of colors and flair. Put the pieces together and what do you get? The main theory is that the blades, shining and fluttering, resemble baitfish that are being chased by a larger predatory fish, which is the expressed profile of the body and skirt. So…how do fishes actually see the bait? And can fishes see in color? The short answer to both of those questions is that fishes see much the same way we do and most can see in color. Remember that fishes are vertebrates just like us! Fishes have two types of sensory cells in their eyes: rods and cones. Rods are sensitive to lower levels of light offering low temporal and spatial resolution and are more prominent in deep water fishes. Cones are sensitive to high levels of light and provide high temporal and spatial resolution. Most inland fishes are exposed to high light conditions and have varying types of cones—these cones are how they see color. So when you are weighing-out your skirt options, keep in mind that color does matter! The general rule of thumb is bright skirts for bright days and dark skirts for dark days. That may seem counterintuitive but it has its reasoning. Think about how water absorbs light. As the light penetrates deeper into the water the larger, low energy red-orange wavelengths of light are absorbed first, then the wavelengths corresponding to yellow, green, blue, etc. are absorbed, respectively. In turbid or deep water a red or orange spinnerbait will be absorbing more light rather than reflecting light it compared to a green or blue spinnerbait. Basically, think about a red fish and a blue fish at some depth where the long red wavelengths of light have been almost entirely absorbed: the blue fish is reflecting blue wavelengths that have not been absorbed by the water while the red fish is almost not visible as it absorbs the remaining high energy, short wavelength light and appears a shade of black instead. The same holds true for a blue and red spinnerbait at the same depth. A black-skirted spinnerbait in turbid water offers a better option than a red-skirted spinnerbait with a more opaque silhouette against the sky. But in clear waters on a bright day that red-orange color scheme will be readily seen as it reflects light. I believe chartreuse spinnerbaits are a great middle-ground option between bright days with clear water and somewhat overcast days with semi-turbid water as they are emitting an intermediary spectrum of wavelengths between the long-wavelength reds and short-wavelength blues. When in doubt go chartreuse—but always be willing to adjust colors and types if one presentation is failing. This is CRUCIAL information for any fisherperson fishing for any fish species with any type of bait. Most of the time I am impressed with professional anglers and enjoy learning from their techniques and methods—at times I am dumbfounded when they have no idea how their target fishes sense their lures. Well, that is partly true, as professional anglers have great instincts and experience which has them viscerally understanding the sensory organs of fishes, but some pro anglers just don’t technically understand the simple biology, and not knowing hurts any fisherperson’s potential to be better. Most anglers are not professionals, or even biologists, so I will make the technical not that technical and share information that will make you a better fisherperson! 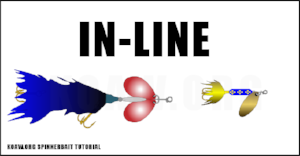 The lateral line—this is a term that should sound somewhat familiar as it is often mentioned in popular fishing magazines and among the optimistic chatter within social bait-shops, and if the lateral line is not familiar, that’s okay! But what exactly is the lateral line? Simply put, the lateral line is a sensory system in fishes that detects vibrations formed by displaced water—this is how fishes feel their aquatic world! The lateral line contains a bunch of sensory hair cells within neuromasts. These neuromasts can be free-standing on the skin or embedded within channels both along the body and within dermal bones of the head. As water flows across a neuromast, the cilia, or itty-bitty hairs, within the neuromast will move with the direction of the current. This movement of hairs will cause a decrease or increase of action potentials, varying the nerve impulses sent to the brain. The brain interprets the impulses and sends reactionary impulses to the muscles. So when your spinnerbait begins to approach a sitting fish, the vibrations being generated by the spinner’s blades are displacing water, sending pressure waves towards that fish. These pressure waves are moving water towards that sitting fish which are characteristically unique compared to the water immediately surrounding the fish. The lure’s pressure waves are detected by the lateral line system (all those neuromasts), the hairs within the neuromasts alter the frequencies of action potentials being sent to the brain, and BAM, that fish’s natural instincts will kick in, causing it to react to your spinnerbait. Simple enough, eh? Hearing—Fishes do have ears! They are set beneath in the dermal (skin) tissue within cranial (head) bones. The previously discussed lateral line system is detecting low frequency pressure waves—usually beneath 100Hz or so, while the inner ear in fishes is detecting higher frequency pressure waves. Often we call pressure waves that pertain to hearing as sound waves. Most fishes do not detect sound above 500-800Hz, but there are some species, like the American shad (Alosa sapidissima), that can detect ultrasonic signals up to 180kHz. Chambers within the inner ear contain otoliths, which are calcium carbonate deposits also known as ear stones. These ear stones rest on sensory hair cells, similar to those in neuromasts of the lateral line system. When your spinnerbait is traveling through the water, not only is it creating those low frequency pressure waves being detected by the lateral line system, but also pressure waves of a higher frequency being detected by the inner ear. Different spinnerbaits produce different pressure waves just as one person’s voice differs from another. GREAT TIP: Fishes can experience hearing loss! This occurs in noisy waters (lots of boat traffic, seismic blasting, etc.) So sometimes it may be advantageous to use an “obnoxious” spinnerbait, that is, one producing lots of pressure waves at high intensity, or amplitude (like turning your stereo to full blast) and a lure with lots of flash. Electroreception is also another sensory system in many types of fishes, such as sharks and rays, which fishes use electrical impulses to feel their world. And there is magnetic reception, as well as chemoreception but that is a discussion for another day. Casting and trolling spinnerbaits are the most practical uses, with jigging, or yo-yoing, methods also implored. Either way, get the blades spinning and you can get a fish—but there are better ways to play spinnerbaits than others. And really, the straight retrieve is often the best—let the lure do the work it was designed to do. This is a must do method for safety-pin spinnerbaits and, at times, for in-line spinnerbaits. In waters with bass and pike, I always use the drop; I have even hooked and landed a hefty musky using the drop with an in-line doubled-bladed spinnerbait. Step 1: After the lure hits the water let the blades establish a normal rotation. This may be achieved by a quick jerk immediately after the lure has landed in the water or any time later during the retrieval. Step 3: Wait 2-4 seconds, or more depending on the depth you wish to sink. Step 4: After waiting, quickly jerk the bait and continue a normal retrieval. I find that pike are more likely to strike the spinnerbait between Step 2 & 3, after the drop has begun, and bass will often strike right after Step 4. Step 2: BEFORE the lure hits the surface, begin your retrieval. Step 4: Commence “The Drop Method” (discussed above) but keep your rod tip high. Step 5: If no strike, keep your rod tip high and reel fast to get the lure back to the surface and resume water-skiing or skimming the lilies. This one is simple enough. And really, I use this when the good ol’fashion straight retrieval is not producing well. Step 1: Cast normally and commence a normal retrieval. Step 2: Every 3 or 4 seconds give the spinnerbait a hard jerk, or two. Step 3: After a jerk, slow the retrieval and speed it up just before the next jerk. These are only three techniques for using spinnerbaits. I encourage you to be creative and always try new things with new setups. Fishing is all about learning and adapting to ever-changing conditions and fish preferences. Best of luck with your fishing! Montgomery, J. C., MacDonald, F., Baker, C. F., & Carton, A. G. (2002). Hydrodynamic contributions to multimodal guidance of prey capture fish behavior in fish. Brain Behavior Evolution, 59, 190-198. Nelson, J. S. (2006). Fishes of the World. John Wiley & Sons, Inc.
Platcha, D. T., & Popper, A. N. (2003). Evasive responses of American shad (Alose sapidissima) to ultrasonic stimuli. Acoust Res Lett Online, 4, 25-30. Schellart, N. M., & Wubbels, R. J. (1998). The auditory and mechanosensory lateral line system. In D. Evans, The physiology of fishes (2nd ed., pp. 283-312). Boca Raton, FL: CRC Press.